These tours move at whip-fast speeds and we’re often in museums and historic sites where you need special permission (which I never have the time, nor the pre-production budget, to arrange) to use a tripod. And even if you have all the permits and paperwork, sometimes it backfires…I just watched an episode of Bill Weir’s Wonderlist on CNN, shot by one of my video heroes and role models, the great Philip Bloom. During the episode, a couple of guards at the Taj Mahal just shut those guys down, despite the fact that they had all the necessary permits and paperwork and even some famous Indian archeologist in tow. Of course, footage of the noble journalist pleading with armed guards and whipping out paperwork makes for good TV, but still, I can’t use that kind of footage for my projects, so I’ve got to improvise and stay under the radar to begin with. (Last time I was at the Taj, I used a bottle cap tripod screw on my water bottle for stability with my RX100iii—they don’t allow anything that even remotely resembles a tripod past security—and shot unmolested:-). Probably the most versatile of the three is the table top tripod/clamp combo that I picked up in the Yodo Bashi camera store in Tokyo about 15 years ago. Yodo Bashi is Japan’s answer to B&H, and everything, from the smallest accessory to the most expensive camera, is out on display, so it’s like a penny candy store for us camera geeks. And I’ve never been able to find a similar clamp/tripod configuration since. I went looking to buy a couple of extra ones on my most recent visit to Tokyo last year, but alas, they were nowhere to be found. Not to worry, though, because the clamp part is only rarely useful, but any good tabletop tripod with an adjustable height feature will be worth its weight in gold as a chestpod, shoulderpod, or if you have the right (or wrong, if ask any personal trainer:-) physical dimensions, as a bellypod (with the screen flipped out for easy reference). The tabletop tripod is like a compact, poor man’s DSLR camera rig…but unlike the rig, it will fit in the end pocket of even the most diminutive camera bag. 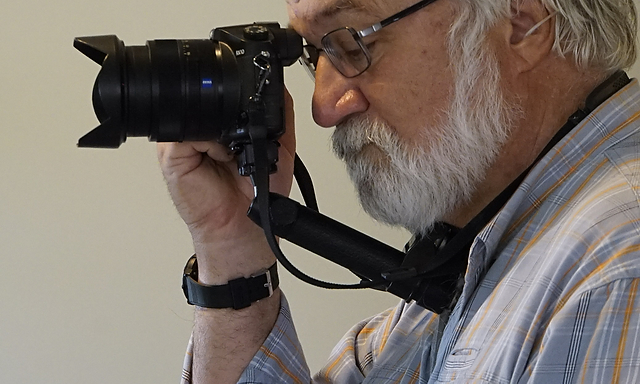 I use mine in a variety of positions…off the chest, if it’s bright out and I have to use the camera’s viewfinder, or off the belly if conditions allow. Pulling on the strap, plus bracing against your body, gives you effectively two points of contact…your eye against the viewfinder might make it three, but combined with the Active stabilization mode in the Sony RX10, it makes for a pretty good platform, even for the longer end of the camera’s zoom range. 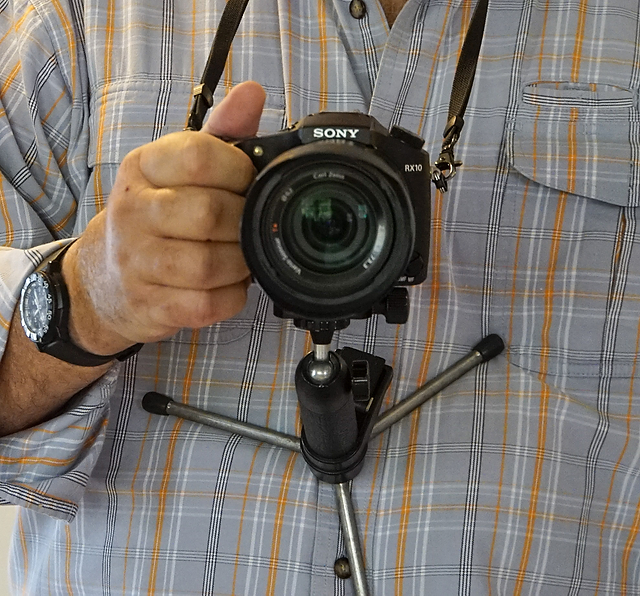 The bellypod arrangement, viewing the flipout screen, is actually an incredibly stable setup, especially for wide angle shots (insert tasteless joke about “unless I’ve had Mexican food for dinner”….see, you can’t outgross me, I’m the prince of puerile post humor:-). The beanbag is the green version from ThePod people and I take some of the filler beads out so I can rest the camera as pictured left…the body sits lower than the lens. These guys will gladly sell you an add-on square mini-beanbag to raise the lens, but it’s smaller, lighter, and cheaper to simply take some stuff out of the GreenPod so the beanbag supports both the body and the lens. 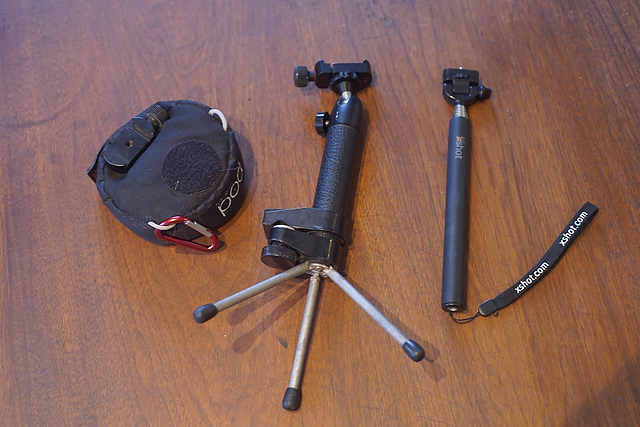 This setup was invaluable on safari in Botswana, and it’s great for stable, low angle shots from the ground. 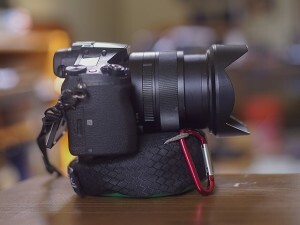 The carabiner lets me clip it to my camera bag when I want to carry it around. I’m not a big fan of selfies—I’ve seen my own puss enough over the years, thank you very much, and I think the whole selfie thing is just an anathema to culturally sensitive travel photography (but that’s another blog post). But damn, those little selfie poles can be very useful. I have one in my bag when traveling, and it matches up great with my favorite pocket camera of all time, the Sony RX 100iii, when I need really low angle shots of feet walking, pigeons eating, or even when I’m snorkeling, to get a little closer to the critters with my Sony Actioncam or Nikon Coolpix AW120, or if I’m caught in a crowd, something to get the camera up over my head. Be sure to get one that is stainless steel or something that won’t rust out on you if you decide to use it in salt water. And you may have noticed that I have a small Kirk quick release bracket mounted on these small stabilizers, all the better to use them quickly and discreetly. But these three light, small accessories punch way above their weight class when it comes to offering portable support for the one-man band, traveling videographer. Great writeup and example, Bob. I have the shot as well and it has been thru the rigors of Tanzania. Invaluable for getting eye level shots of the wildlife where getting out of th vehicle is prohibited (and foolhardy!). I have several shots with a female lion and some young hyenas with that thing as well as holding the camera up high as we drive thru herds of wildebeest. Getting the high vantage video really shows the expanse of the Serengeti and the multitude of the wildebeest. Still getting used to the Sirui monopod but it does offer some distinct advantages for a quick and dirty stand in for my fluid head tripod. Great post, as usual. Thank you, Bob! 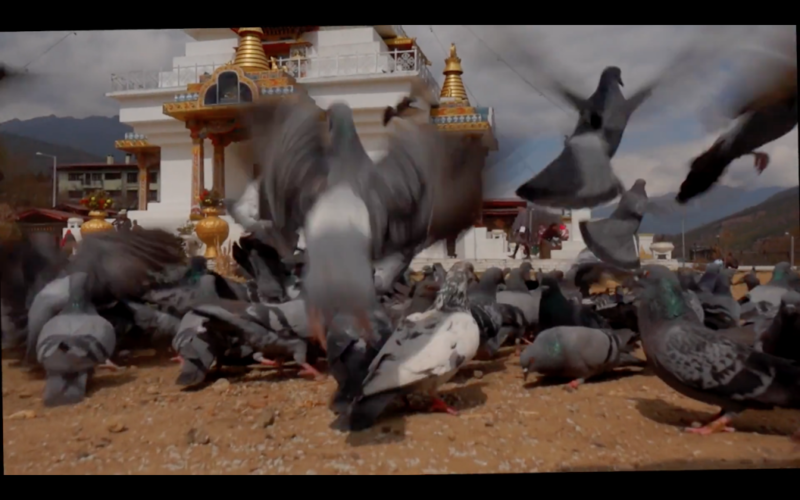 Love the Slo Mo at Baktapur. We were there in November. Excellent tips as usual in sharing information to show that great work doesn’t need big dollar gear. Amazing video! Love the vibe you captured and the slow mo really highlights it perfectly. I will definitely try the tripod set-up! Amazing post, I love the close up picture of the birds. 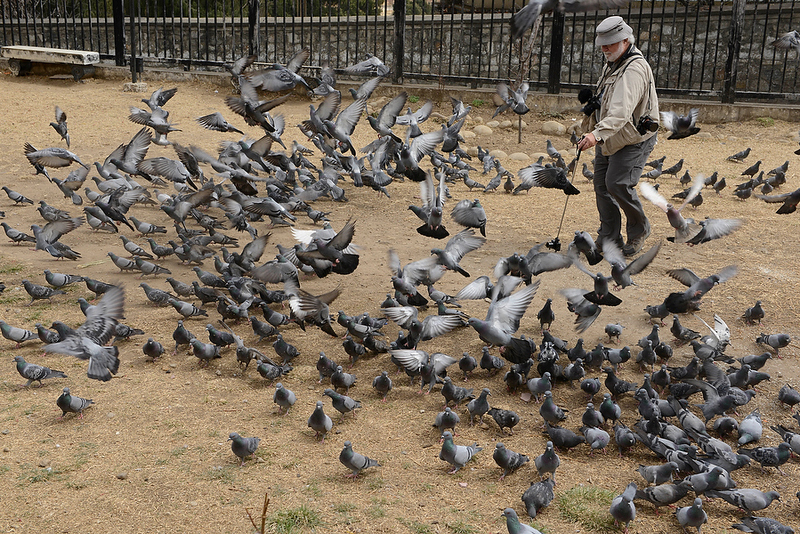 Don’t think I’ve ever enjoyed looking at a pigeon from that angle before, well done.